if i had to be a fish, i would be THIS fish. 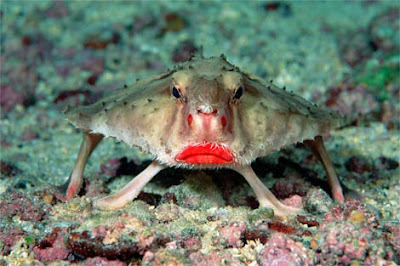 "Like a marine Mick Jagger, a rosy-lipped batfish pouts near Costa Rica's Cocos Island. Batfish are poor swimmers, preferring to use their strangely adapted pectoral fins like legs to crawl about the seafloor. Photograph by Birgitte Wilms/Minden Pictures"